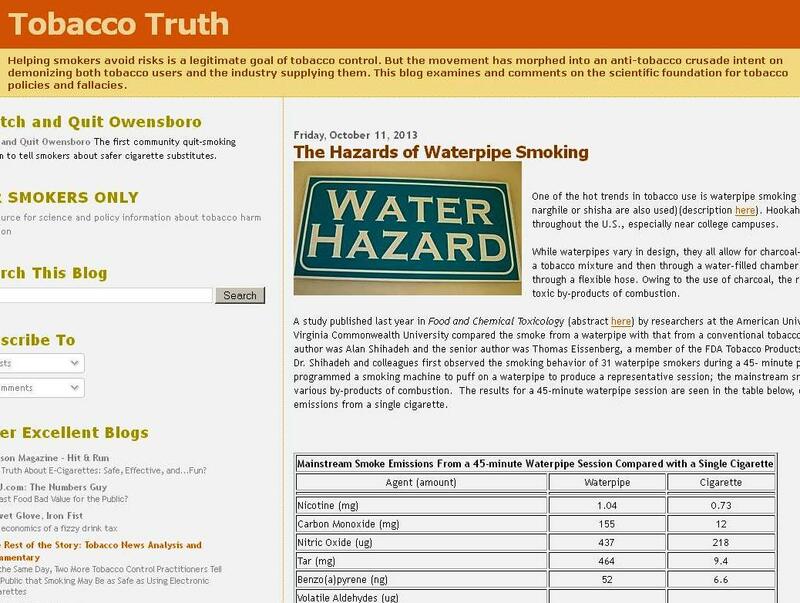 From a recent article published by Dr Brad Rodu on his own “blog” (amazingly titled “Tobacco Truth”…. ), it is now clear that most new «Tobacco Harm Reduction (THR)» advocates (*), particularly those having received funding from the tobacco industry (dubbed Big Tobacco), have now jumped on the global anti- ««waterpipe»» (warcode name) wagon driven by the antismoking research, mainly funded, directly or indirectly, by the pharmaceutical industry (nicotine “replacement” tool; such products and medicines as nicotine gums, patches, Chantix, etc.). For memory, a few years ago, a so-called yearly “Tobacco Harm Reduction” report attacked in a similar dishonest way the now gone-global Middle East Peace Pipe. The document cited ««evidence» to be found in papers published, among others, in a renowned Big Pharma journal (“Nicotine and Tobacco Research”) particularly prominent in the world antismoking market. Based on such a pseudoscientific Gospel, Dr Rodu quickly draws his own conclusions: “Waterpipe smoking produces unacceptable levels of toxic contaminants. Don’t be snookered by hookah” . While others have been simply plagiarising our own critical publications (from Bertrand Dautzenberg (Office Français du Tabagisme – the fanatic sister organisation of Action on Smoking and Health) and Jean-Yves Nau (journal Le Monde) in France to Olivia Maynard in the United Kingdom)[5-6], our right-to-the-point response to Dr Brad Rodu’s ignorance will remain the above cited article recently published in the BJC. This is because in 1000 words, it shatters one full decade of pseudoscientific –often violent- claims and methods regarding the so-called toxicity of shisha/narghile smoking, by the very researchers Dr Rodu blindly relies on . Like it or not, the smoke chemistry of a properly prepared hookah (not the biased one set up in the laboratory of the US-AUB, spearhead of the global prohibition agenda)) is very much more similar (essentially vapour and glycerol and the unavoidable CO due to the charcoal) to that of a E-cigarette than of a regular one. Users of the Middle East Peace Pipe and their friends and relatives, beware of that global dirty campaign… Please know that when it comes to your cultural tradition, there is now a global pseudoscientific consensus between Big Tobacco, Big Pharma and many advocates of harm reduction products like the E-cigarette or smokeless tobacco of the Swedish SNUS type. (* ) We say “contemporaneous” “Tobacco Harm Reduction” advocates because the Middle East Peace Pipe is actually the first natural tobacco harm reduction in the world, in spite of all their ««waterpipe»» pseudo-science since the beginning of their global crusade against the MEPP by year 2002, i.e. in the wake of some events in the USA (see article: ) . One of the obvious reasons is clear when one takes into consideration the high amounts of tobacco smoked in it during a single session and from an early date in History. Brad Rodu. The Hazards of Waterpipe Smoking. 11 Oct 2013. Chaouachi K. False positive result in study on hookah smoking and cancer in Kashmir: measuring risk of poor hygiene is not the same as measuring risk of inhaling water filtered tobacco smoke all over the world. Br J Cancer. 2013 Apr 2;108(6):1389-90. doi: 10.1038/bjc.2013.98. Epub 2013 Mar 7. Author’s copy available. Maynard OM, Gage SH, Munafo MR. Are waterpipe users tobacco-dependent ? Addiction. 2013 Nov;108(11):1886-7. doi: 10.1111/add.12317. See: Is the Electronic “Healthy Shisha” Really Healthy ? SciTopics [research summaries by experts]. 2010 (16 Nov).